When students attend our unique campus, they are welcomed into a comfortable educational environment. 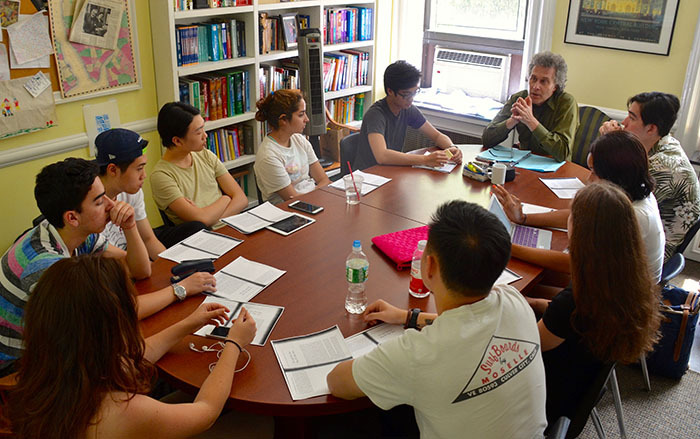 Our New York City high school offers small classes with a commitment to individualized learning. Within our Manhattan school townhouse, quality instruction is delivered with a student-centered focus. Our location is ideal for academics – a quiet neighborhood for scholarly pursuits, which is close to a great number of educational opportunities. This climate of learning allows our private school faculty to provide personalized attention for all students, inspiring them to reach for their potential. A Beekman education underscores the benefits and importance of small class sizes in high school. Our student-teacher ratio supports the full scope of learners, including the college preparatory, pre-professional, underperforming, and gifted high school student. The Beekman School is located in an East Side Manhattan townhouse that has been converted into a modern learning environment. Great care has been taken to retain the warm feeling inherent in the original building while providing the latest tools for a first-class educational experience. A Beekman education is enhanced by our location in New York City. Our quiet neighborhood is part of the fabric of East Side Manhattan and is within walking distance of major landmarks such as the United Nations, Grand Central Terminal, St. Patrick's Cathedral and Rockefeller Center. New York's major art museums, including the Museum of Modern Art, The Metropolitan Museum of Art and the city's famous Museum Mile, are all just a short trip away. We are a dynamic and creative high school that understands the value of uniting traditional academics with advanced technology. Our students benefit from modern facilities that include fully equipped high school classrooms with interactive and high-tech tools. The Beekman School provides state-of-the-art educational resources, such as SMART Boards, a fully equipped science laboratory, and a modern computer lab. Our private high school also has inviting spaces designed for learning. Interests are shared in the halls, classrooms, student lounge, and outdoor garden. Beekman combines the best of both worlds. It offers a warm atmosphere where traditional and high-tech classroom instruction can come together for the student’s advantage. We put up-to-date resources into the hands of students so they gain the knowledge they need to succeed.